SpamTitan confirms that we will support customers running WebTitan on supported Operating Systems in a VMware virtual machine environment. SpamTitan will provide unqualified support for WebTitan for VMware running in a VMware virtual environment in an identical manner as with WebTitan ISO running on any other major x86 based systems without initially requiring reproduction of issues on native hardware. Should SpamTitan suspect that the virtualization layer is the root cause of an incident; the customer will be required to contact the appropriate VMware support provider to resolve the VMware issue. 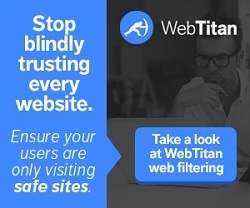 While SpamTitan products are expected to function properly in a VMware virtual environment, there may be performance implications which can invalidate WebTitan typical sizing and recommendations. Technical Support operates during the hours of 09:00am – 01:00am Irish Time, Monday – Friday, excluding bank and public holidays of the Republic of Ireland (the “Hours of Operation”). 1 Call for support on live usage issue needing urgent response including severe disruption of service resulting in no mailflow. 2 Call to report operational problem requiring resolution / work-around. 3 Information / fault report requiring no action before next release.